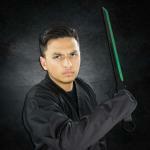 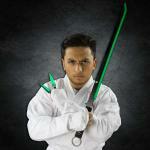 Get your fellow sword lovers to be green with jealousy with the Green Blade Kunai Ninja Sword. 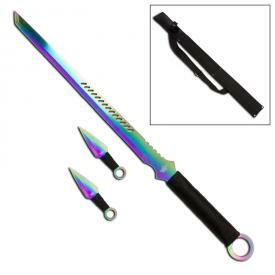 This ninja sword set has a single 27" sword and matching 5" kunai that are both green and black in color. 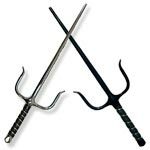 The sharp bladed weapons are made from stainless steel and, because even the sword is made from a single piece of metal, they're all full tang. 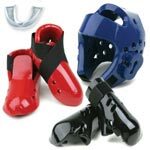 The green ninja weapons set comes with a specialized carrying sheath that has a long strap so that you can carry your full-tang sword on the go with little effort and pull out your green throwing knives at a moment's notice. 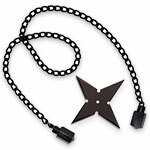 The specially-designed sword matches the ring pommel of the kunai, which means you can tie a ring around it for long-ranged attacks. This sword and kunai weapons set is great for weapons collectors because of its beautiful design. 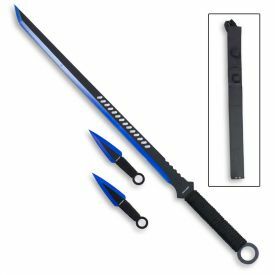 The keen green edge on this modern metal ninjato is sharp and the blade even has holes etched in the side so that the sword will be lighter and more aerodynamic. 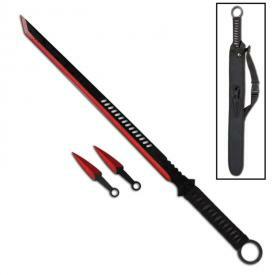 The handle has cord wrapping for comfort, meaning the green ninja sword and green kunai are also good for actual combat. 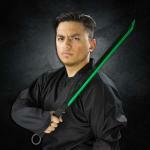 Just remember to keep the blades clean when not in use.